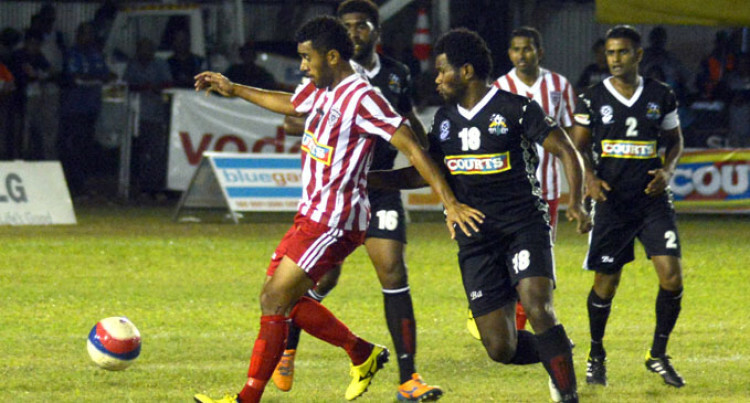 The Taniela Waqa- captained Labasa side put on a sterling performance to hold Ba 1-1 in their second pool match in the Courts IDC at Govind Park, last night. Both teams played to expectation in the feature match of the day. In the 43rd minute Avinesh Waran Suwamy send a perfect feed for Laisenia Raura to score beating goalkeeper Akuila Mateisuva. But Ba fans was shocked when Ravinesh Karan Singh scored the equaliser a minute later. Ba with the services of Alvin Singh, Remueru Tekiate, Josefata Neibuli, Malakai Tiwa, Malakai Rakula, and Laisenia Raura still like the team to beat in the tournament. Labasa with the services Edwin Sahayam, Ravinesh Singh, Gabrieli Matanasiga, Ilisoni Logaivou, Taione Kerevanua, and Taniela Waqa combined well. Ba and Labasa have four points each and and are in on track to progress through. The ‘Men in Black’ face Rewa while Labasa play Nadroga as both teams only need a draw to qualify for the semifinals. Star turn: Malakai Tiwa and Laisenia Raura were in top form. Big Play: Edwin Shayam and Ravinesh Karan Singh played well. Comments: Labasa coach Bal Sanju Reddy said, “Proud of the boys on how they play. Ba coach Imdad Ali said, “It was a good game, we expect Labasa to come out firing and fast.